UK Prime Minister David Cameron said there was a “pretty slim” chance he could hold a referendum on the country's membership of the European Union in 2015. “I've said there will be a re-negotiation and then a referendum – obviously the sooner that re-negotiation can get done the better and quite frankly the chances of doing that inside 2015 after an election in May is pretty slim,” he told ITV's Good Morning Britain. 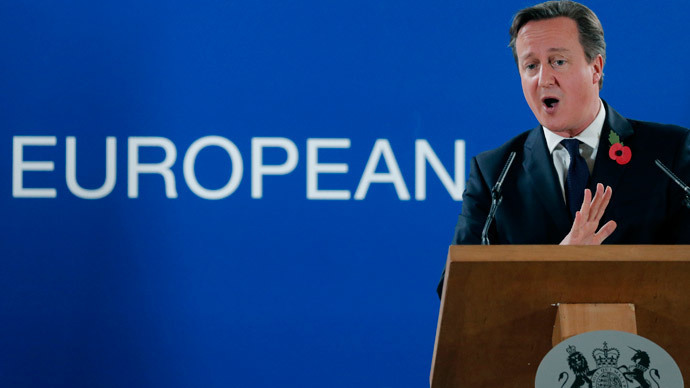 Cameron has promised to renegotiate Britain's relationship with the EU, as many Eurosceptic are leaning towards the anti-EU UK Independence Party (UKIP). His comments come after UKIP leader Nigel Farage said he would want a vote to be held in 2015 if UKIP went into coalition with the Tories. “I want a full and fair referendum to be held in 2015 to allow Britons to vote on being in or out of the EU,” he said. “It is my strong belief that the four million EU citizens living in the UK without British passports should not be allowed to [vote in the UK],” he told the Sunday Telegraph. “My intuition is that treaty change is close to mission impossible today because it's not only about rationality, about good argument,” Tusk told the Guardian. With less than two months to go before the general election, the Tories are two points ahead of the Labour Party (31 percent and 29 percent respectively) according to the latest Lord Ashcroft opinion poll.